I'm excited to participate in Wednesday's Walk Down Memory Lane. This meme has brought me much joy. Thank you Lynnette! I always enjoy meeting new people. But after I wrote about my Grandpa Sumstad, I was contacted by a person who said ...we're related. I know, I know. You have to be careful on the internet. Some people might be skeptical but he's the real deal. Bill Sumstad had family photos. And we were able to compare details. He lives near Seattle, WA with his wife Sharon. 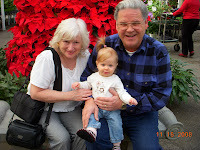 Check out the photo with their grandchild. And he put me in touch with other family members, including Ogee who lives in Oslo, Norway. How cool is that? Do you know what else has brought me joy from this? My niece Katie Sumstad wrote something on my Facebook wall that made me smile. She wrote that she actually reads my Wednesday posts ...because she enjoys learning new things about our family! She hasn't left a comment YET but I'm just glad that she reads it. Thank you Katie! Love you! I had the opportunity to visit Norway one time. It was in the mid 80's and I went with my parents. That worked out great since they are fluent in the language. I know a little bit, along with many phrases but that's about it. Of course, I hope that changes when I can finally focus on my online Norwegian lessons from L-Jay of My Little Norway. 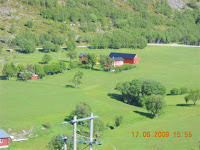 I want to share a few memories and photos of Sumstad. Many people who know me, especially old friends from high school (Facebook has been great to reconnect), knew me as Debbie Sumstad. 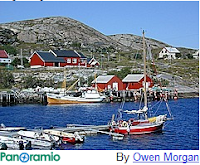 What they may not know is that Sumstad is the name of a little town in northern Norway. My family name was Hagen. It was common for people who left and immigrated to the US to take on the name of the town. So, Henrik Hagen became Henry Sumstad, my grandpa. 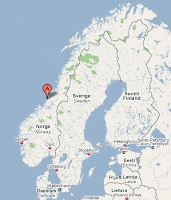 The map on the right shows Norway and the red A is where Sumstad is located. I was thrilled to spend time in Oslo, Bergen, Trondheim and then ...Sumstad. My dad's cousin Kjell took us for the long drive to the family farm. Ogee is another newly discovered family member. He lives in Oslo, Norway and he sent me a few photos. He recently had the opportunity to visit Sumstad and sent this one on the left. It's a very peaceful place to visit. The photo on the right is the original house. I think that must have been where my grandfather lived growing up. This is the grave stone of my grandfather's mother and father. His mother was Helga and his dad was Kristian. I know I have many more photos but I think this is enough for right now. It's kind of funny because I have lots of pretty photos of my mother in her bunad (traditional Norwegian costume) but I only have this one of me. My husband Greg would laugh and say ...that's my Viking! Now, don't forget to visit Lynnette to check out other's posts on Wednesday's Walk Down Memory Lane. What fun memories & family history! The only thing i know of Norway is that the family in "Mama's Bank Account" came from there. I always loved that book! That is so cool Debbie (and I love you as a Viking)! What a rich heritage. Just love it! Thanks for sharing these great family memories! Have a great day! What a neat heritage! I didn't know that my name's spelling is Norwegian. My Mom's maiden name was Christian, so that's where she came up with my name. I have battled the spelling all my life, because everyone always wants to spell it Kristen. It is also a fun way to keep family heritage and memories alive and tell younger family members our memories of the past. Thanks for stopping by my blog today "Pooh's Corner" and leaving such a sweet comment. It means alot! Great memories and you look so cute. It's so awesome how God is bringing your family together online. I can't get over how cool it is that you connected with family from your Wednesday's Walk. That is so cool. I would love to visit Norway - looks lovely. How neat that you were able to visit. So awesome that you have met new relatives through this blog thing. Norway seems like it would be a great place to visit. Who would have ever thought people could connect like they do on Facebook and blogs! The older I get the more I enjoy learning about my family history! That is wonderful you know so much and have even visited there! 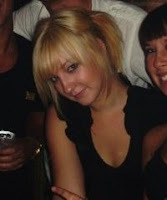 I love the picture of you! LOL! Thanks for the comment too!